My desire to eat guacamole every day has been in existence for almost two years now. It’s highly viewed as a summer appetizer but I can have it on almost anything during any season. Indulging in guac hasn’t been a thing for me for too long. I think the first time I even tried it was my freshman year of college… I’ll probably be about it for many years to come though. Maybe it’s the freshness? The inviting vibrant shade of green? The light texture in your mouth? Or, maybe it’s the avocado. The smooth clean tree fruit (also, barely, known as the alligator pear) is so fresh and carries such a unique stand-alone taste. My dad and I make a mean bowl of guac at the house. We use tomatoes and onions from our garden, add a slash of fresh lime, crack of pepper, pinch of chili powder & hit up Stop and Shop for two ripe avocados. We even have a semi-festive bowl to put the guacamole in since we have yet to invest in a molcajete. Molcajete, is a stone bowl that medicine, spices fruits, etc are traditionally ground up in in Central & South America. It easily and evenly smashes foods with the tejolote hand-tool. Nevertheless, our guac comes out killer! It’s fresh and has flavor blasting in every bite. Our house also has a solid selection of things to dip in the guac. You can go with the classic tortilla chip, a crunchy salted Cape Cod Chip or even some raw red peppers. Oh, you’re in New Haven and want some guac now that I’m makin’ ya drool about it? Go to Geronimo on Crown St! 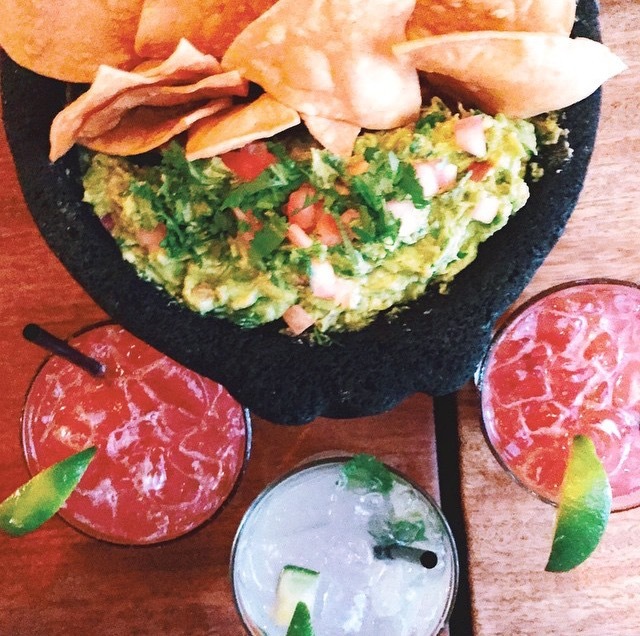 They make their guac right in front of you… tableside is $15 and it’s worth it! I decided to write about the avocado because right now I’m in an Au Bon Pain down the road from school. For those who aren’t familiar with Au Bon Pain, it’s French chain fast bakery that was inspired by a French bakery oven display in Boston’s Faneuil Hall in 1978. This specific Au Bon Pain opened up last week so I’ve been passing the “Newly Opened” & “50% off Welcome Discount” for a few days now. I figured since I’ve yet to successfully contact Comcast, therefore continue to remain without wifi, I might as well pop into the new establishment and get a warm sandwich. I went with an Egg White Wheat. It was Egg Whites, Cheddar Cheese, Avocado & lemon aioli on a wheat bagel. Honestly, the lemon aioli was way better than I had estimated for being served from an overpriced chain bakery. The garlic-y citric olive oil coated the wheat bread giving it almost a sweet tone somehow. My sandwich was good enough. Deff filled me up and it was 50% off for the welcome promoting. I don’t think I’d ever get it again though. 1 because it was only tasty for the price I paid. If I paid full price I would have been disappointed with the quality of the sandwich as a whole. But 2 because there hasn’t been a time where I went to Au Bon Pain and been impressed. And 3 because I try to stay away from any place that isn’t locally owned. P.S. This Au Bon Pain said they weren’t allowed to give out free cup of water? So yea, you inferred it correctly, I only went to this place because I knew I could use their wifi & get a cheap meal. It seems like eating guac is almost a fad, it’s never been so craved/advertised in my lifetime as it is today. I ain’t mad about it!! Previous Post Wok the Fok, Man? !